Pascal Ackermann wins a wet race. The race: Here's the report from winner Pascal Ackermann's Bora-hansgrohe team. After a crash with 80km to go, the BORA – hansgrohe train worked hard for their leader Pascal Ackermann. In the finale, the young German Champion waited until the perfect moment and sprinted to his third WorldTour victory in this season and took the win ahead of E. Viviani. 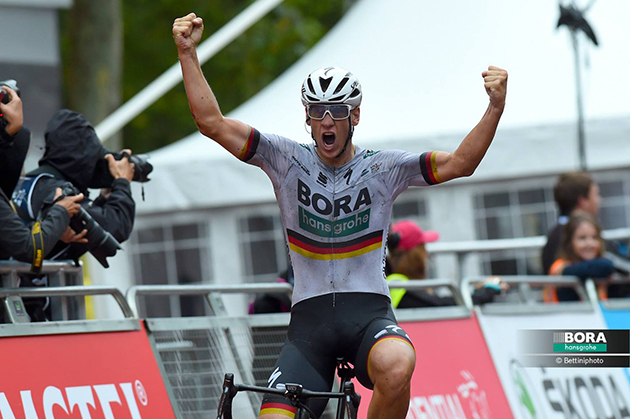 After the Grand Prix Cerami, BORA – hansgrohe travelled to London and turned its attention to the Prudential RideLondon, the 1.UWT race. The 187km course included five intermediate sprints and five categorised climb and went through the city of London. BORA – hansgrohe focused on their German Champion Pascal Ackermann, the team was to concentrate their efforts on bringing Pascal into an optimal position in the finishing strait, to give him the best chance at producing a strong result. The race started at 14:00 on wet streets and after some kilometres of racing six riders pulled away and built the breakaway of the day, while BORA – hansgrohe stayed in the peloton. With 50km to go Jay McCarthy and Peter Kennaugh launched an attack and formed a new breakaway with 5 other opponents, however it came all back together with 10km to go. The BORA - hansgrohe train started to form for their leader Pascal Ackermann. Rudi Selig and Christoph Pfingsten brought the German Champion into a perfect position, Pascal waited for the perfect moment and started his sprint to take his third WorldTour victory in this season. 4 GARCIA Ivan Bahrain-Merida s.t. 6 BAUHAUS Phil Team Sunweb s.t. 7 DRUCKER Jean-Pierre BMC s.t. 9 KOCH Jonas CCC Sprandi Polkowice s.t. 10 BARBIER Rudy Ag2r La Mondiale s.t. 11 MEZGEC Luka Mitchelton-Scott s.t. 12 CAVENDISH Mark Dimension Data s.t. 13 HOULE Hugo Astana s.t. 14 LAWLESS Christopher Sky s.t. 15 RICKAERT Jonas Sport Vlaanderen-Baloise s.t. 16 NAVARDAUSKAS Ramunas Bahrain-Merida s.t. 17 LAMMERTINK Maurits Katusha-Alpecin s.t. 18 DENZ Nico Ag2r La Mondiale s.t. 19 VAN HOOYDONCK Nathan BMC s.t. 20 BATTAGLIN Enrico LottoNL-Jumbo s.t. 21 VAN ROOY Kenneth Sport Vlaanderen-Baloise s.t. 22 ROELANDTS Jurgen BMC s.t. 23 TRENTIN Matteo Mitchelton-Scott s.t. 24 HAAS Nathan Katusha-Alpecin s.t. 25 ULISSI Diego UAE-Team Emirates s.t. 26 MAESTRI Mirco Bardiani-CSF s.t. 27 TRATNIK Jan CCC Sprandi Polkowice s.t. 28 BAKELANTS Jan Ag2r La Mondiale s.t. 29 SELIG Rüdiger Bora-hansgrohe s.t. 30 GONÇALVES José Katusha-Alpecin s.t. 31 CURVERS Roy Team Sunweb s.t. 32 BYSTRØM Sven Erik UAE-Team Emirates s.t. 33 MENTEN Milan Sport Vlaanderen-Baloise s.t. 34 VAN EMDEN Jos LottoNL-Jumbo s.t. 35 ANTUNES Amaro Manuel CCC Sprandi Polkowice s.t. 36 WYNANTS Maarten LottoNL-Jumbo s.t. 39 EDMONDSON Alexander Mitchelton-Scott s.t. 40 PFINGSTEN Christoph Bora-hansgrohe s.t. 41 MULLEN Ryan Trek-Segafredo s.t. 42 VAN ASBROECK Tom EF Education First-Drapac s.t. 44 MODOLO Sacha EF Education First-Drapac s.t. 46 VILLELLA Davide Astana s.t. 47 OLIVIER Daan LottoNL-Jumbo s.t. 48 SCHLEGEL Michal CCC Sprandi Polkowice s.t. 49 GEOGHEGAN HART Tao Sky s.t. 50 MCCARTHY Jay Bora-hansgrohe s.t. 52 SCOTSON Miles BMC s.t. 54 VERWILST Aaron Sport Vlaanderen-Baloise s.t. 55 COSTA Rui UAE-Team Emirates s.t. 56 LAENGEN Vegard Stake UAE-Team Emirates s.t. 57 MØRKØV Michael Quick-Step Floors s.t. 58 BAK Lars Ytting Lotto-Soudal s.t. 59 STANNARD Ian Sky s.t. 60 LAMBRECHT Bjorg Lotto-Soudal s.t. 64 MATTHEWS Michael Team Sunweb s.t. 66 LINDEMAN Bert-Jan LottoNL-Jumbo s.t. 69 VENTER Jaco Dimension Data s.t. 70 LANGEVELD Sebastian EF Education First-Drapac s.t. 71 SÉNÉCHAL Florian Quick-Step Floors s.t. 77 WALSCHEID Max Team Sunweb s.t. 80 DAVIES Scott Dimension Data s.t. 82 FARAZIJN Maxime Sport Vlaanderen-Baloise s.t. 83 JUUL-JENSEN Christopher Mitchelton-Scott s.t. 87 HALVORSEN Kristoffer Sky s.t. 88 CIEŚLIK Paweł CCC Sprandi Polkowice s.t. 90 JAKOBSEN Fabio Quick-Step Floors s.t. 91 GOUGEARD Alexis Ag2r La Mondiale s.t. 92 TUFT Svein Mitchelton-Scott s.t. 95 PLANET Charles Team Novo Nordisk s.t. 97 VAN GOMPEL Mathias Sport Vlaanderen-Baloise s.t. 98 VAN ZYL Johann Dimension Data s.t. 99 MAGNUSSON Kim EF Education First-Drapac s.t. 100 SIMION Paolo Bardiani-CSF s.t. 101 RENSHAW Mark Dimension Data s.t. 102 PERON Andrea Team Novo Nordisk s.t. 103 BOLE Grega Bahrain-Merida s.t. 104 SHAW James Lotto-Soudal s.t. 105 HOFLAND Moreno Lotto-Soudal s.t. 106 MOSER Moreno Astana s.t. 107 DIDIER Laurent Trek-Segafredo s.t. 108 DENNIS Rohan BMC s.t. 109 ALBASINI Michael Mitchelton-Scott s.t. 110 SISR Frantisek CCC Sprandi Polkowice s.t. 111 NOPPE Christophe Sport Vlaanderen-Baloise s.t. 112 GANNA Filippo UAE-Team Emirates s.t. 113 SWIFT Ben UAE-Team Emirates s.t.